Weather Protected fabric won't shrink or stretch. - Elasticized cord in bottom hem for a custom fit. - Extended adjustable buckle across the bottom for windproof. I will do my best to resolve the problems. · Wide body design for effortless pushing. · wide body design for effortless pushing. · Folded size 17.5” x 15.75” x 33.6”. Material: High quality Polyester. We do our best to resolve any issue. We will do everything we can to give you a satisfying solution. It is convenient and easy to fold in one simple step. The new and big wheel make it rolling easily in the high grass. 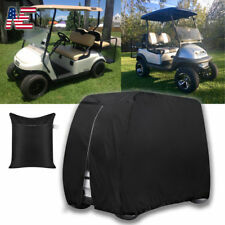 The strong, stable 4-wheel body design maintains a unique lightweight and compact folded size for easy storage in car trunks before or after your round of golf. The front wheel can Swivel in any direction or locked to move straights. 30″ wide body design for effortless pushing. 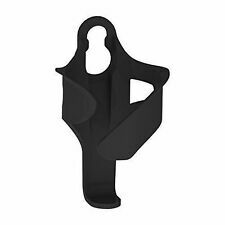 Clamp type upper bag bracket secure the golf bag easily. Umbrella holder and storage rack included. It has quick folding operation and foot brake. Don't hesitate to buy it! Umbrella holder included, Scorecard holder and beverage holder. One-Step quick folding operation. Adjustable push handle to accommodate different hand positions. Handy rear zipper for easy access and installation. Handy back zipper for easy access and installation. CAR & BICYCLE ACCESSORIES. Weather protected fabric won't stretch or shrink. 1 x Storage Bag. Free carrying bag included for easy storage. Made of high quality waterproof oxford cloth. Weather protected fabric won't stretch or shrink. With convenient waterproof storage bag, easy for carry and storage. Model: CaddyCruiser ONE - V8 BLUE. The new and big wheel make it rolling easily in the high grass. The strong, stable 4-wheel body design maintains a unique lightweight and compact folded size for easy storage in car trunks before or after your round of golf. 31" Wide body design for effortless pushing. Miscellaneous basket with zip closure and built-in cooler with drain holes. Easy to fold and unfold. Three large 11.5"x2.6" EVA maintenance-free wheels with ball bearings. Model: CaddyLite ONE - Swivel V8 -Silver. Golfers can switch between swivel or straight mode by toggling the lever on the handle to move on or off the golf course with ease and swiftly. The front wheel can Swivel in any direction or locked to move straight. We face enough adversity and distraction during a round of golf as it is. Elasticized cord in bottom hem for a custom like fit. Material: Nylon PVC. If you do not receive our reply within 48 hours, pls. If you are satisfied with our service, pls. Color: Taupe. SUN MOUNTAIN SPEED CART V1 GOLF PUSH CART 3 WHEEL RED. SUN MOUNTAIN SPEED CART V1 GOLF PUSH CART 3 WHEEL RED.. Condition is Used. Shipped with USPS Parcel Select Ground. 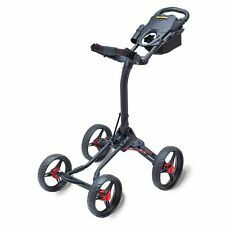 clicgear model 8 Golf Push Cart. Condition is Used. Shipped with FedEx Ground or FedEx Home Delivery. Large Storage Console & Net. Zippered Doors open to the side for easy entry. Color: Black. 27" wide body design for effortless pushing. Umbrella holder and storage rack included. Large 11.5” x 2.4” Rear and 10.5” x2.4” Front EVA maintenance-free wheels provide perfect balance and traction on all types of terrain. Duffel bag included. Our unique covers is protects against rain,snow,sun,bird poop,tree sap and dirt and won't crack in cold weather. Elasticized cord in bottom hem for a custom like fit. Color: Taupe (with the sample picture similar). Trending at $31.32eBay determines this price through a machine learned model of the product's sale prices within the last 90 days. 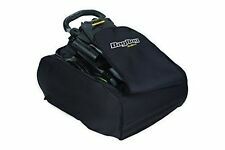 Bag Boy M-300 Basic Folding Push/Pull Golf Cart Satisfaction Guaranteed LOOK . Condition is Used. Shipped with USPS Priority Mail. Great Condition RV3J pushg scooter for youth sized golf bags. Bat-Caddy X4 Sport Electric Push Cart w/ Free Accessory Kit, 33Ah SLA, Silver, N. Condition is Used. Shipped with USPS Parcel Select Ground. Duffel bag included. Our unique covers is protects against rain,snow,sun,bird poop,tree sap and dirt and won't crack in cold weather. Color: Taupe (with the sample picture similar). We will try our best to reduce the risk of the custom duties. What's worse is these vagabonds can end up in the trunk of your car, or carpet of your SUV. This is the new MAG spoked wheel with foam rubber tread. Models 2.0 and 1.0 require Accessory Tab (Included). Fits Large bottles, 48oz (1.5L). The unique light weight and compact folded size make the storage in car trunks easily before or after your round of golf. Model: CaddyLite 15.3 V2 - Black. 28" wide body design for effortless pushing. Smallest Folding Golf Caddie! - Variable speeds to match your walking pace. - Folds with ease and within seconds. - Battery will last way past 18 holes! Caddytex Caddy Lite 11.5 V3 Push Cart Golf. Condition is Used. Shipping via usps priority or fedex. Sold as is in working condition. Shows signs of use. Fully functioning! Great cart. Model: CaddyCruiser ONE - V8 SILVER. The new and big wheel make it rolling easily in the high grass. 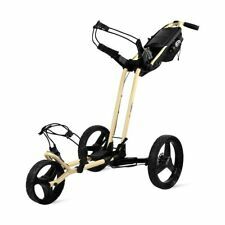 The strong, stable 4-wheel body design maintains a unique lightweight and compact folded size for easy storage in car trunks before or after your round of golf. 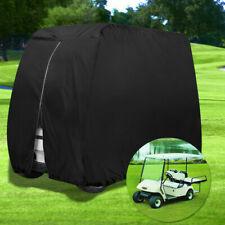 And can be folded to compact size for easy storage in car trunks before or after your round of golf. The 11.5" rear and 9.5" front wheels make it rolling easily in the high grass. Easy fold for storage. It will fit. BEFORE ordering! They own the factory- they ARE the factory. Again, they don’t outsource these components, parts, and accessories- they make them all in house. It is the black color. Built-in accessory knob and an all new accessory line. Sealed precision ball bearings ensure an easy roll and are maintenance free. The ergonomic and adjustable handle positions arms and shoulders in their most natural position. 4 out of 5 stars - NEW BagBoy Golf Express DLX Pro Push / Pull Cart - Pick the Color! 1 product rating1 product ratings - NEW BagBoy Golf Express DLX Pro Push / Pull Cart - Pick the Color!